IEX, the company founded by “Flash Boys” hero Brad Katsuyama, has won approval to run a US stock exchange. 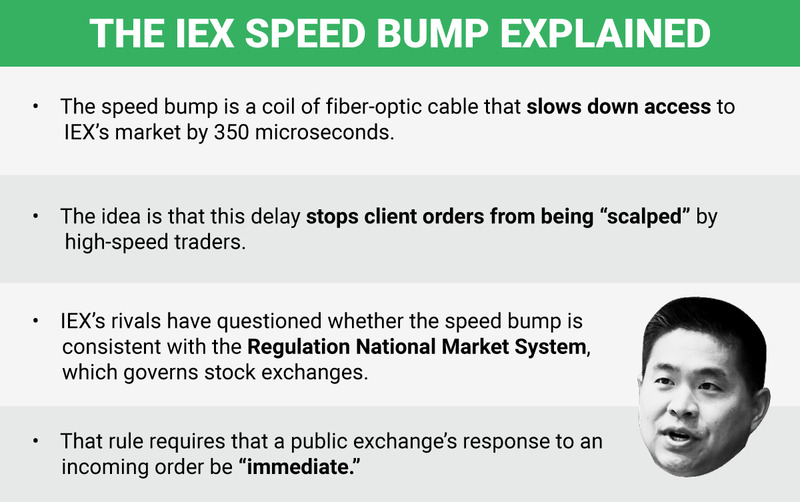 IEX filed with the Securities and Exchange Commission to become a stock exchange last year, kick-starting an ugly battle with the incumbent exchanges. 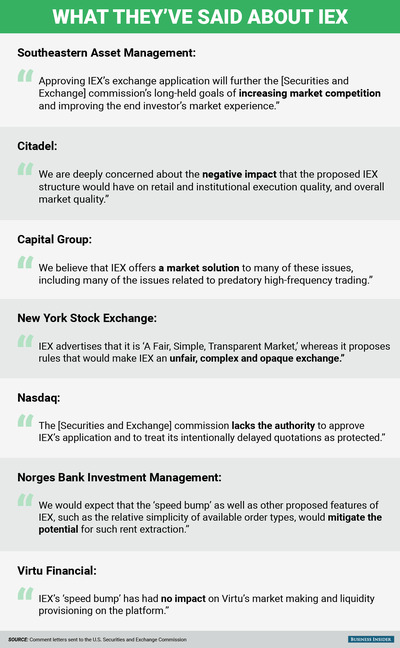 On Friday June 17, the SEC said in a document that IEX had won full approval. Business Insider spoke with Katsuyama before the decision about high-frequency trading, his mission, and the controversy surrounding the firm. Brad Katsuyama: Business is good. The company is profitable. Everything is pointing in the right direction. We’ve been stalled slightly with the application process, but it has been rewarding in that it has created a huge amount of support behind us, and our opposition has become very transparent. That ultimately, long run, will help us. 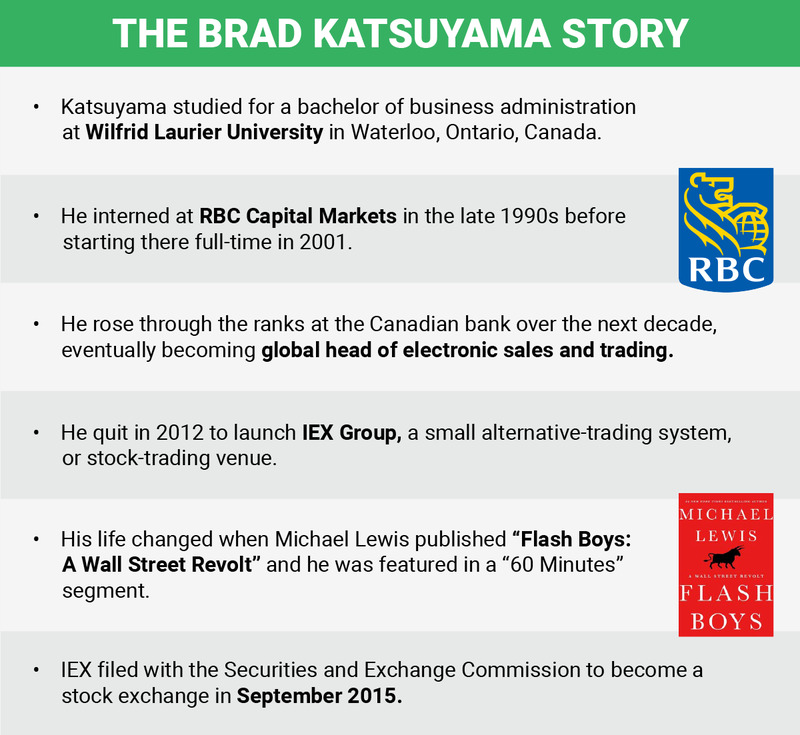 Katsuyama: When it first started to happen, it was pretty chaotic. We hit our rhythm pretty quickly in terms of understanding what we can control and what we can’t. Internally we did a very good job of saying “What are our priorities?” and basically came to the resolution pretty early that there were a lot of things we were unwilling to bend on. Once you realise that there are only certain points which you are willing to negotiate, it makes the negotiation much simpler. They have asked for more disclosure, they have asked for a variety of things, and we’ve made a small change to the way that we route shares. But were we willing to give up the speed bump? The answer is no. It ultimately came down to, were we willing to change in a way that would harm our ability to protect investors? The answer is no. We’d rather be declined, in fact. We made that pretty clear. Once you stop tossing and turning over decisions, once you’ve got your priorities straight … we got our priorities straight pretty early, so for us it has been a pretty focused period. My wife says all the time she can’t believe how calm I am through this whole thing. We feel very strongly about what we’re doing and why we’re doing it. Turner: Had you expected the level of pushback? You must have expected some, but is has gotten pretty heated. Katsuyama: It surprises me because I never expected the opposition to be as transparent against a solution that protects investors. When we have basically an entire army of investors behind us, supporting us, it is such a sharp contrast versus who is opposing us, and I’m surprised the exchanges took that stance. I do think we’ll be able to look back on this and feel like this was a pretty pivotal moment. What would have been dangerous is if all this was playing out privately in DC, behind the scenes, that would be more dangerous to us. Because they could say publicly that they are supportive of investor-based solutions, but be working behind the scenes to protect [the status quo]. I think that would have been the case had we not had so much public support from some of the biggest investors in the world. Having them on the record supporting us forced the opposition, if they wanted to stop us, to be public in their opposition, and that is what has led to a public debate rather than a private one. A private one would have been hard because then we would have had to say ‘Oh, they are doing this and doing that,’ without any real tangible things to point at. Now they’re doing very public, nasty things, and that has been helpful for us. Turner: You mentioned the exchanges. There has also been some feedback from the high-frequency trading firms, which are in many cases customers. Citadel in particular has been highly critical. Has their response surprised you? Katsuyama: It has been interesting because there are some high-frequency traders that have been supportive of IEX, like Virtu, and some that have been vocally opposed to us, like Citadel. From our standpoint, we think it is good because we don’t think all forms of high-frequency trading are good for the market, and we’ve said that all along. It was never about eliminating high-speed trading; it was about eliminating unfair advantages that are in the market. I think if you are a beneficiary of these unfair advantages, you don’t like IEX. If you don’t need these advantages to earn your living, then you’re probably actually OK with what we’re doing, and maybe you like it because other people are able to buy an advantage, whereas you’re trying to earn it through your strategy or your fundamental analysis. We’ve split the world of high-frequency trading in a way. Turner: Would you have done anything differently through this whole process? Katsuyama: I feel like — not to say we haven’t made mistakes, we’ve made them, we’ve learnt from them — but I feel like we’ve done everything we can, and if we were to do it all again we’d do it the same way. 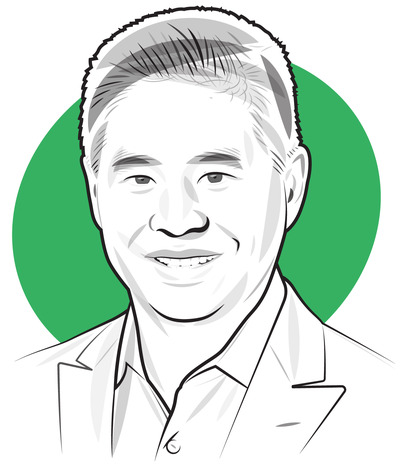 There wasn’t an easier path for IEX. We were going to have to get into a large fight to come out on the other end with the kind of market we wanted and with our integrity intact. I don’t think there was a path of least resistance that we could have travelled, that would have made success easier. I don’t think so. We’ve tried to make the best decision. Not all of them have been right, but we’ve gotten it right quite a lot. We would have liked to have fought back at times when we bit our tongue. And just trying to understand that there is a level of fatigue that the industry probably has. When someone says something that is so blatantly wrong, responding to it actually draws more attention to that comment than not responding. There have been things that we’ve seen — I’ve probably written a number of op-eds that have never seen the light of day — because it is just lying, it is lying, but if I respond to this, if IEX responds to this, have we emboldened that person? Have we validated their opinion? It turns out that ignoring it at times was the right call. We’ve done that a lot, in terms of trying to say we know we’re right, we know our supporters know we’re right, we’re trying to take the high road as much as possible. Turner: But you have fought back. Katsuyama: We have — absolutely. We have fought back through the comment process, and we have fought back on things that are fundamental to our market. What we haven’t engaged in is the peanut gallery and chatter, and we know that a lot of these talking heads — it is just not worth responding. Turner: I notice you’ve got an award from the Tribeca Disruptive Innovation Awards on your shelf. How hard is it to disrupt an industry like finance? Katsuyama: It is easier to disrupt consumer finance. It is much harder to disrupt institutional finance, Wall Street. It is very heavily regulated, and because it is institutional finance, you are dealing with incumbents. You have to find a way to interact with the people that do face the end client. It made the banks and brokers our clients, rather than us trying to go to the end users ourselves. It is much harder than building a product where the consumer can make the choice. For us, the consumer can make the choice, but they also have to get their broker to agree to that choice and get them to execute it the way they want it. It is a harder form of disruption, which makes what we’re trying to do even more important, because there are aspects of finance that absolutely should be changed. That is part of the battle here. My general sense is that exchanges are charging the industry that they serve many, many multiples, many billions of dollars more than they should for the services they provide. Turner: What does that look like? Are you referring to charging for access to market data? Katsuyama: It is kind of funny in a way, because who actually creates the content? It is the banks and brokers. The exchanges have put themselves in this interesting position where they don’t create any original content, but they control the distribution of that, and people have a regulatory obligation to buy that data. Market data is one of the touchiest subjects in the industry, and we’re on the side of the industry. The prices are egregious. What the exchanges are charging is going to change. It is funny because information in general, in other industries, is becoming more free. Turner: You’ll have news by June 18. What will happen if you get good news? Katsuyama: If there is good news, the brokers will need some time to connect and configure their systems, and we will give them some time to do that, and a couple months after that it would be our official launch date. Turner: And what if there is bad news? Katsuyama: If it is unsuccessful, hopefully we’ll get details as to why. One of the challenges of going through this process is understanding exactly why. 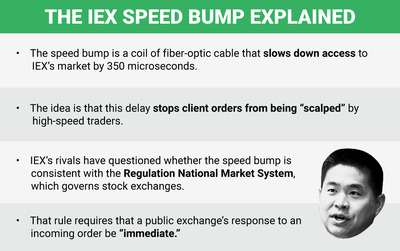 It is one thing for someone to say “IEX is unfair,” but tell me exactly how it is, tell me exactly what rule. There has been a lot of rhetoric. There hasn’t been a lot of specificity. There are many ways that we could probably protect investors, but understanding what we can’t do and can do would be helpful for us as we try and re-craft a solution that may fit inside the regulation. Turner: You would go again? Katsuyama: Absolutely. Time is our friend right now. We’re well capitalised and we’re profitable, and we have a good base of supporters. We’ll definitely go again. Turner: You said a moment ago that some of the rules seem a little unclear. It seems they were written for a different kind of market. Katsuyama: It was written at a time when I don’t think anyone was considering this much controversy of 350 millionths of a second. That is the bit which makes us laugh, where people say investors will see stale prices. It is 300 microseconds. This speed bump is 1,000 times faster than you blinking your eye. No one is going to notice any difference. The other ironic part is that the complaint over the speed bump, the 350 microseconds, acts as if the market is devoid of latency already. There is tons of latency. The Chicago Stock Exchange, being in Chicago, automatically creates latency. These arguments are odd if put in the proper context. If your goal is to create the perception that IEX is unfair and will hurt the market, you have to be a little bit bold in your rationality. Turner: You said at the outset that the company is profitable. What does the profit and loss statement look like? Katsuyama: We’ve raised over $100 million in capital. We still have a lot of that. We still haven’t deployed a lot of it. I can’t talk about our exact P&L, but we’re profitable. I want to say it has probably been a year we’ve been profitable. The trend on market share has been pretty good. The last quarter over quarter was flat. Every quarter before that was growing. It is partly a product of us being stuck in limbo. We’re still the second- or third-largest ATS, so from that standpoint we’re as large, roughly, as an ATS will get, which is also why it is important for us to apply to go through the process of becoming an exchange. It gives us the ability to scale. Turner: The last four years must have felt like a crazy ride. How has it been? Katsuyama: My personality and nothing from my past would have ever predicted that I would be at the center of a controversy. That is one of the ironies that Michael Lewis found. He actually admitted that he was having trouble writing about me in particular, exactly because of how uncontroversial I was. I didn’t have this rebellious streak in me. To me, I’m a product of circumstance. Because of the relationships I’ve developed with people, it has helped me create the right time, the right network, the right culture, that is helping us get through this. Katsuyama: We wanted to build a company that reflected the mission we’re on — people who cared as much about doing good as they did about making money. To do that you have to find the right people. We’ve had a very good track record of finding the right people. In a way, if I was this massively controversial figure, it would have been harder for people to sign up for this mission. I am a fairly go-with-the-flow guy. Don’t get me wrong, I have convictions. I’m not afraid to stand up for what we believe in. It is shocking that I’m in the position I’m in. Turner: But you give the impression that you wouldn’t trade this position for something else. Katsuyama: This is the life that I am pretty sure I was meant to lead. I’m pretty comfortable in it. I am very thankful that Michael Lewis wrote the book the way he did, because he kind of portrayed me in the way I think I am, meaning this problem found me. I wasn’t looking to go out there and rabble-rouse. I really could have retired at RBC 30 years from now. That would have been the best bet and the most likely career. I liked it there. I had a lot of friends there. Some of my friends worked there. It was safe. The money was good. That was the most likely outcome. We stumbled onto this problem, and one thing led to another. We do spend a lot of time trying to not read a lot of things to really feed into that. I can tell you — the “60 Minutes” segment — I have been at events where people have played bits of it. I watched it twice that night. I probably watched it less than five times. It is just doesn’t help us run this company, help me run this company. Running has been a great outlet. I try to meditate. I try to focus on trying to run this company to the best of my ability, making decisions and focusing on what we know we can control, and putting people at this company in the best position to succeed. That is my focus. A lot of things that go with everything that has happened with us do not help me do those things, and, if anything, make it harder to do those things. Turner: How has it made it harder? Katsuyama: It made it harder to find those people after the book because the book added another element to why someone would want to work here, other than doing the right thing. I do think it made it slightly more confusing after the book because we got flooded with résumés, and it was hard to understand people’s intentions. Before anyone knew who we were, especially before we had any funding, in those days it was either you believe in this or you don’t believe in this. We started in a 200-square-foot room with no windows, with nine of us. Part of the reason that we’re profitable is that we’ve been diligent about costs. We’re not a typical startup because a lot of us come from banks, and so we understand P&L. We’ve been pretty smart about how we run this business. We came from very humble beginnings. Turner: If you get approval, won’t your life get easier? Does the controversy not die down? Katsuyama: I don’t know the answer to that. The money hasn’t been lost; the wealth transference hasn’t occurred. It will still be a battle. On June 17, we might get permission to compete. It is still a competition. It is still going to be fierce. I don’t really plan on letting our guard down. Turner: And how are you feeling ahead of the big decision?